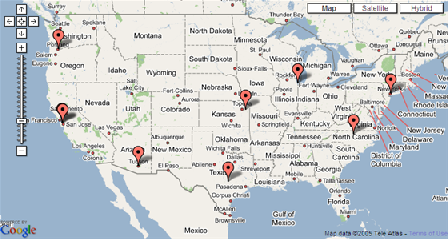 Foodservice Rewards is using my Google Maps mashup to allow people to see which distributors participate in their program. They announced it in a seminar last week to their manufacturers and received very positive feedback. Here is their blog post announcing it. Go see the functionality on their site. I have recently completed some custom Salesforce.com / Google Maps mash-ups for clients and have made some improvements to the whole integration. First, it has been updated to utilize the Salesforce.com PHP5 Toolkit. Performance is improved from the nusoap toolkit. Also, if you are running a PHP 5 version after 5.1.2, the toolkit supports compression, which is great. Ability to use Yahoo! or Google Geocoder APIs: Yahoo! currently supports the US only. Google supports many countries such as United States, Canada, China, Japan, the UK, France, Germany, Italy, and Spain. I have been opting for the Google API, but both work well. Caching of Geocode lookups. Cache your successful lookups to a MySQL database for faster retrieval the next time you Geocode it. This is an optional feature. I put up a new demo of it in action. For this demo, I decided to get a little fancier and show how a form can drive the results returned in the map. My clients typically want the querying capabilities to be dynamic, so adding forms is common. This demo has a very simple form to demonstrate the capabilities. However, for some of projects, I am building forms dynamically based upon the metadata in the Salesforce.com org. Pretty cool! If you are interested in this functionality being customized for your organization, please visit the product page on the Arrowpointe website and complete the form on that page. Bikramfinder.com is running a customized version of my Salesforce.com/Google Maps mashup to help people find locations of Bikram yoga studios across the U.S. I helped them customize a version that uses their Salesforce.com instance as a back-end and allows a search by zipcode or city. Check it out at http://www.bikramfinder.com/find_studio/. The overall site is still getting setup, but the mapping functionality is there. If your organization is looking to utilize your Salesforce.com database as a back-end for mashing up data with Google Maps, you can download my sample PHP scripts as a start. If you are interested in some outside assistance in doing this, please contact me. The Google Maps Mashup category on this blog.